First of all couple of weeks back, I was able to put out an article about riot-web. It’s been on my mind for almost a month or more hence finally sat down, wrote and re-wrote it a few times to make it simpler for newbies to also know. One thing I did miss out to share was the Debian matrix page . The other thing which was needling me was the comment . This is not the first time I have heard that complaint about riot-web before and at times had it happen before. The thing is its always an issue for me when to write about something, how to say something is mature or not as software in general has a tendency to fail at any given point of time. For such queries I haven’t the foggiest idea as to what to share as the only debug mode is if you have built riot from source and run the -debug tests but can’t say that to a newbie. One of the things which I didn’t mention is if any researchers tried to get data out of riot-web because AFAIK twitter banned lot of researchers who were trying to get data out of their platform to do analytics etc. This I sort of remembered as I read an open letter couple of days before by researchers about independent oversight over facebook as a concern as well. It would have been interesting if there were any new interesting studies made from riot-web implementation, something similar to how a study of IRC I read some years ago. The mathematical observations were above my head but still some of the observations were interesting to say the least. There has been another pattern I have been seeing in the newer decentralized free software services. While in theory, the reference implementation is supposed to be one of many, many a times, it can become the defacto implementation or otherwise you have the irc way where each client just willy-nilly did features but still somehow managed to stay sane and interoperate over the years but that’s a different story altogether for a different day. The easiest example is contacts migration. Most professionals have at least a hundred or two contacts, now if few go missing during migration from either one version to the other or from one platform to the other, they either don’t have the time or the skills to figure out why part-migration succeeded and the rest didn’t. Of course there is a whole industry of migration experts who can write code which would have all the hooks to see that the migration works smoothly or point out what was not migrated. These services are wholly commercial in nature and also one cannot know in advance how good/bad the service is as usually issues come to bite much later. On another note altogether, had been seeing the sort of java confusion from a distance. There’s a Mars Sims project I have been following for quite sometime, made a few bug-reports and for reasons unknown, was eventually made a contributor. They are also in a flux as to what to do. I had read the lists.debian.org/debian-java off-and-on the web and was glad to point out the correct links. I had read the rumors sometime back that Oracle was bull-charging Java so that it would be the only provider in town and almost everybody would have to come to it for support rather than any other provider. I can’t prove it one way or the other as it’s just a rumor but does seem to have sense. As a user I recommend Debian to my friends, clients because of the stability as well as security tracker but with upstreams in a sort of non-cooperative mood it just adds that much more responsibility to DD’s than before. I was pleased to see a reply from Daniel as a reaction to my post. I read and re-read the blog couple of times yesterday and another time today to question my own understanding and see if there is anyway I could make life easier and simpler for myself and other people whom I interact with but finding it somewhat of an uphill task. I will not be limiting myself to e-mail alone as I feel until we don’t get/share the big picture it would remain incomplete. 1. The first one is probably cultural in nature (either specific to India or its worldwide I have no contextual information.) Very early in my professional and personal life I understood that e-mails are leaky by design. By leaky I mean being leaked by individuals for profit or some similar motive. Also e-mails are and were used as misinformation tools by companies and individuals then and now or using sub-set or superset of them without providing contextual information in which they were written. While this could be construed as giving straw man I do not know any other way. So the best way, at least for me is to construct e-mails in a way where even if some information is leaked, I’m ok with it being leaked or being in public domain. It just hurts less. I could probably give 10-15 high-profile public outings in the last 2-3 years itself. And these are millionaires and billionaires, people on whom many people rely on their livelihoods should have known better. In Indian companies, for communications they do have specific clauses where any communication you had with them is subject to privacy and if you share it with somebody you would be prosecuted, on the other hand if the company does it, it gets a free pass. 2. Because of my own experiences I have been pretty circumspect/slightly paranoid of anybody promising or selling the cool-aid of total privacy. Another example which is of slightly recentish vintage and pains me even today was a Mozilla add-on for which I had done RFP (Request for Package) which a person for pkg-mozext-maintainers@lists.alioth.debian.org (probably will be moved to salsa in near future) packaged and I thanked him/her for it. Two years later it came to fore that under the guise of protecting us from bad cookies or whatever the add-on was supposed to do, it was actually tracking us and selling this information to third-parties. This was found out by some security researcher casually auditing the code two years down the line (not mozilla) and then being confirmed by other security researchers as well. It was a moment of anguish for me as so many people’s privacy had been invaded even though there were good intentions from my side. I do know it’s a lot to ask for as Debian is a volunteer effort. I am happy to test or whichever way I can contribute to Debian if in doing so we can raise the bar for intended or unintended malicious apps. to go through. I am not a programmer but still I’m sure there might be somehow I could add strength to the effort. 3. The other part is I don’t deny that Google is intrusive. Google is intrusive not just in e-mail but in every way, every page that uses Google analytics or the google Spider search-engine be used for tracking where you are and what you are doing. The way they have embedded themselves in web-pages is it has become almost impossible to see almost all web-pages (some exceptions remain) without allowing google.com to see what you are seeing. I use requestpolicy-continued to know what third-party domains are there on web-page and I see fonts.googleapis.com, google.com and some of the others almost all the time. The problem there is we also don’t know how much information google gathers. For e.g. even if I don’t use Google search engine and if I am searching on any particular topic and if 3-4 of the websites use google for any form or manner, it would be easy to know the information and the line/mode or form of the info. I’m looking for. That actually is same if not more of a problem to me than e-mails and I have no solution for it. Tor and torbrowser-launcher are and were supposed to be an answer to this problem but most big CDNs (Content Distributor Networks) like cloudfare.com are against it so privacy remains an elusive dream there as well. 5. It becomes all the more dangerous when in mobile space where Google Android is the only vendor. The rise of carrier-handset locking which is prevalent in the west has also started making inroads in India. In the manufacturer-carrier-Operating System complex such things will become more common. I have no idea about other vendors but from what I have seen I think the majority might probably be doing the same. IPhone is supposed to also have lot of nastiness where it comes to surveillance. 6. My main worry for protonmail or any other vendor is should we just take them at face-value or is there some other way for people around the world to be assured and in case things take a worse time be possible to file claim for damages if those terms and conditions are not met. I looked to see if I could find an answer to this question which I asked in my previous post and I looked but didn’t find any appropriate answer in your post. The only way I see out of is decentralized networks and apps but they too leave much to be desired. Two examples I can share of the latter. Diaspora started with the idea that I could have my profile in one pod, if for some reason I didn’t like the pod, I could take all the info. to another pod with all the messages, everything in an instant. At least till few months back, I tried to migrate to another pod and found that feature doesn’t work/still a work in progress. Similarly, zeronet.io is another service which claimed to use de-centralization but for last year or so I haven’t been able to send one email to another user till date. I used both these examples as both are foss and both have considerable communities and traction built around them. Security or/and anonymity is still at a lower path though as of yet. I hope I was able to share where I’m coming from. One of the things If I had got the visa on time for Debconf 15 (Germany) apart from the conference itself was the attention on VR (Virtual Reality) and AR (Augmented Reality) . I had heard the hype so much for so many years that I wanted to experience and did know that with Debianities who might be perhaps a bit better in crystal-gazing and would have perhaps more of an idea as I had then. The only VR which I knew about was from Hollywood movies and some VR videos but that doesn’t tell you anything. Also while movie like Chota-Chetan and others clicked they were far lesser immersive than true VR has to be. I was glad that it didn’t happen after the fact as in 2016 while going to the South African Debconf I experienced VR at Qatar Airport in a Samsung showroom. I was quite surprised as how heavy the headset was and also surprised by how little content they had. Something which has been hyped for 20 odd years had not much to show for it. I was also able to trick the VR equipment as the eye/motion tracking was not good enough so if you put shook the head fast enough it couldn’t keep up with you. I shared the above as I was invited to another VR conference by a web-programmer/designer friend Mahendra couple of months ago here in Pune itself . We attended the conference and were showcased quite a few success stories. One of the stories which was liked by the geek in me was framastore’s 360 Mars VR Experience on a bus the link shows how the framastore developers mapped Mars or part of Mars on Washington D.C. streets and how kids were able to experience how it would feel to be on Mars without knowing any of the risks the astronauts or the pioneers would have to face if we do get the money, the equipment and the technology to send people to Mars. In reality we are still decades from making such a trip keeping people safe to Mars and back or to have Mars for the rest of their life. If my understanding is correct, the gravity of Mars is half of earth and once people settle there they or their exoskeleton would no longer be able to support Earth’s gravity, at least a generation who is born on Mars. But this is taking away from the topic at hand. While I saw the newer generation VR headsets there are still a bit ways off. It would be interesting once the headset becomes similar to eye-glasses and you do not have to either be tethered to a power unit or need to lug a heavy backpack full of dangerous lithium-ion battery. The chemistry for battery or some sort of self-powered unit would need to be much more safer, lighter. While being in the conference and seeing the various scenarios being played out between potential developers and marketeers, it crossed my mind that people were not at all thinking of safe-guarding users privacy. Right from what games or choices you make to your biometric and other body sensitive information which has a high chance of being misused by companies and individuals. There were also questions about how Sony and other developers are asking insane amounts for use of their SDK to develop content while it should be free as games and any content is going to enhance the marketability of their own ecosystem. For both the above questions (privacy and security asked by me) and SDK-related questions asked by some of the potential developers were not really answered. At the end, they also showed AR or Augmented Reality which to my mind has much more potential to be used for reskilling and upskilling of young populations such as India and other young populous countries. It was interesting to note that both China and the U.S. are inching towards the older demographics while India would relatively be a still young country till another 20-30 odd years. Most of the other young countries (by median age) seem to be in the African continent and I believe (might be a myth) is that they are young because most of the countries are still tribal-like and they still are perhaps a lot of civil wars for resources. I was underwhelmed by what they displayed in Augmented Reality, part of which I do understand that there may be lot many people or companies working on their IP and hence didn’t want to share or show or show a very rough work so their idea doesn’t get stolen. I was also hoping somebody would take about motion-sickness or motion displacement similar to what people feel when they are train-lagged or jet-lagged. I am surprised that wikipedia still doesn’t have an article on train-lag as millions of Indians go through the process every year. The one which is most pronounced on Indian Railways is Motion being felt but not seen. There are both challenges and opportunities provided by VR and AR but until costs come down both in terms of complexity, support and costs (for both the deployer and the user) it would remain a distant dream. There are scores of ideas that could be used or done. For instance, the whole of North India is one big palace in the sense that there are palaces built by Kings and queens which have their own myth and lore over centuries. A story-teller could use a modern story and use say something like Chota Imambara or/and Bara Imambara where there have been lots of stories of people getting lost in the alleyways. Such sort of lore, myths and mysteries are all over India. The Ramayana and the Mahabharata are just two of the epics which tell how grand the tales could be spun. The History of Indus Valley Civilization till date and the modern contestations to it are others which come to my mind. Even the humble Panchtantra can be re-born and retold to generations who have forgotten it. I can’t express it much better as the variety of stories and contrasts to offer as bolokids does as well as SRK did in opening of IFFI. Even something like Khakee which is based on true incidents and a real-life inspector could be retold in so many ways. Even Mukti Bhavan which I saw few months ago, coincidentally before I became ill tells of stories which have complex stories and each person or persons have their own rich background which on VR could be much more explored. We would need to work out the complexities of both hardware, bandwidth and the technologies but stories or content waiting to be developed is aplenty. Once upon a time I had the opportunity to work, develop and understand make-believe walk-throughs (2-d blueprints animated/bought to life and shown to investors/clients) for potential home owners in a society (this was in the hey-days and heavy days of growth circa around y2k ) , it was 2d or 2.5 d environment, tools were lot more complex and I was the most inept person as I had no idea of what camera positioning and what source of light meant. Apart from the gimmickry that was shown, I thought it would have been interesting if people had shared both the creative and the budget constraints while working in immersive technologies and bringing something good enough for the client. There was some discussion in a ham-handed way but not enough as there was considerable interest from youngsters to try this new medium but many lacked both the opportunities, knowledge, the equipment and the software stack to make it a reality. Lastly, as far as the literature I have just shared bits and pieces of just the Indian English literature. There are 16 recognized Indian languages and all of them have a vibrant literature scene. Just to take an example, Bengal has been a bed-rock of new Bengali Detective stories all the time. I think I had shared the history of Bengali Crime fiction sometime back as well but nevertheless here it is again. So apart from games, galleries, 3-d visual interactive visual novels with alternative endings could make for some interesting immersive experiences provided we are able to shed the costs and the technical challenges to make it a reality. Happy Independence Day to all. I had been looking forward to this day so I can use to share with my brothers and sisters what little I know about TOR . Independence means so many things to many people. For me, it means having freedom, valuing it and using it to benefit not just to ourselves but to people at large. And for that to happen, at least on the web, it has to rise above censorship if we are to get there at all. I am 40 years old, and if I can’t read whatever I want to read without asking the state-military-Corporate trinity than be damned with that. Debconf was instrumental as I was able to understand and share many of the privacy concerns that we all have. This blog post is partly a tribute to being part of a community and being part of Debconf16. So, in that search for privacy couple of years ago, I came across TOR . TOR stands for ‘The Onion Router’ project. Explaining tor is simple. Let us take the standard way in which we approach the website using a browser or any other means. a. We type out a site name, say debian.org in the URL/URI bar . b. Now the first thing the browser would do is look into its DNS Cache to see if the name/URL has been used before. If it is something like debian.org which has been used before and is *fresh* and there is content already it would serve the content from the cache there itself. c. In case, if it’s not or the content is stale or something, it would generate a DNS lookup through the various routing tables till the DNS IP Address is found and information relayed to the browser. d. The browser takes the IP Address and opens a TCP connection to the server, you have the handshake happen and after that it’s business as usual. e. In case if it doesn’t work, you could get errors like ‘Could not connect to server xyz’ or some special errors with error codes. This is a much simplified version of what happens or goes through normally with most/all of the browsers. One good way to see how the whole thing happens is to use traceroute and use the whois service. Just using whois IP Address gives much more. I just shared a short version because I find it interesting that Debian has booked all 255 possible IP Addresses but speculating on that would be probably be a job for a different day. b. The conversation is relayed over 2-3 relays and it will give a somewhat different identification to the DNS server at the other end. c. It is only at the end-points that the conversation will be in plain text. There are various motivations for doing that. For myself, I’m just a private person and do not need or want that any other person/s or even the State should be looking over my shoulder as to what I’m doing. And the argument that we need to spy on citizens because Terrorists are there doesn’t hold water over me. There are many ways in which they can pass messages even without tor or web. The Government-Corporate-Military just get more powerful if and when they know what common people think, do, eat etc. So the question is how does you install tor if you a private sort of person . If you are on a Debian machine, you are one step closer to doing that. 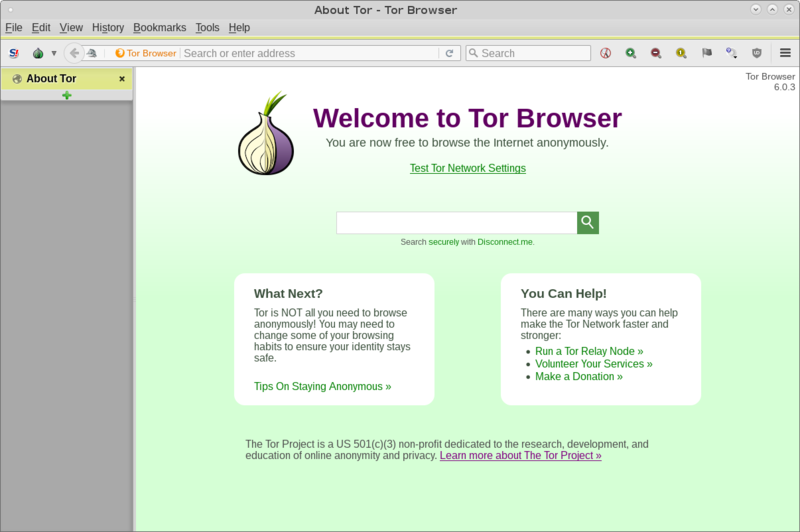 As can be seen above, you basically download the tor browser remotely from the website. Obviously, for this port 80 needs to be opened. One of the more interesting things is that it tells you where it installs the browser. Additionally it would give you 4 choices. Depending on your need for safety, security and convenience you make a choice and live with it. It is suggested that you do not use the same usernames on the onion network. Now there would be others who would want to use the same/similar settings say as there are in their Mozilla Firefox installation. a. First close down both Torbrowser and Mozilla Firefox . c. Now copy the following files over from your mozilla profile to your tor browser profile and you can resume where you left off. Once the above is done, fire up your torbrowser with the alias shared. This is usually put it in your .bashrc file or depending on whatever terminal interpreter you use, wherever the config file will be. Welcome to the world of TOR. Now, after a time if you benefit from tor and would like to give back to the tor community, you should look up tor bridges and relay. As the blog post has become long enough, I would end it now and hopefully we can talk about tor bridges and relay some other day. This will be the last post in series on Debutsav 2014 held at Amrita University and consequently will be biggish. This is somewhat of a short post about some possible answers that are needed for better functioning of whatever broadband is needed/wanted.